Downward facing dog is perhaps the most commonly used (and abused) yoga posture. That makes the chance of overuse injury in this pose pretty high, especially from my vantage point as a licensed clinician who has both studied and practiced yoga for more than 25 years and taught thousands of people and practitioners. I’ve also spent far too much time seeing and treating yoga injuries that could have been prevented with proper instruction. So let’s get down to the nitty gritty of why downward facing dog is not a beginner pose, and what we can do about it. Ain’t nobody got time for yoga injuries. Extreme Dog: Reversal of Spinal Curves & Extreme Shoulder Flexion © 2018. GingerGarner.com All rights reserved. There are too many degrees of freedom. Degrees of freedom represent the number of variables that contribute to safe and sustainable execution of movement. In human beings, DFD is a posture that “stands” on the hands and feet, and asks you to balance the weight between them. It turns you upside down, which immediately challenges mechanoreception – knowledge of where joints are biomechanically aligned in space. It also impairs proprioception, knowledge of where you are in space, because we just don’t spend much time, if any, inverted as human beings. A cursory count of degrees of freedom available in a pose like DFD would easily exceed the number of joints we have in our body, and the only contact with the ground for closed kinetic chain movement are the hands and feet. Still yet, there are degrees of freedom available in the fingers, wrist, and rays of the feet and subtalar and calcaneus despite their being earth bound. The spine, pelvis, and shoulder probably complicate the degrees of freedom available the most, because they are areas common to malalignment and pain in the average individual. They are also areas which people struggle with the most when it comes to proprioception. So flip them upside down and the difficulty with safe movement is magnified. That automatically alters someone’s neuroception, the abilty to detect risk.And when that happens, flight, fight, or freeze (or worse) can occur. It’s beyond the scope of this post to discuss the neuroscience of how a posture can habituate a poor stress response, but suffice to say, poor posture execution can contribute to, or perpetuate, persistent pain. The psychological impact of a pose also becomes, in some cases, more important than the quality of the movement itself. I’ll save this discussion, which must include explanation of polyvagal theory, for a future post. Tired Dog: U Shaped “Lazy Boy Recliner” ©2018. GingerGarner.com All rights reserved. It isn’t a difficult pose to perform. That sounds like an argument FOR use of DFD as a beginner posture, except that it isn’t. What I mean by that is anyone can cheat her or his way through a sloppy DFD, but that cheating through it makes it an unsustainable. You can only cheat your way through DFD for so long before something has to give, like your spine, shoulder, pelvis, or orofacial area. These are the typical areas I see injury, in addition to the wrists and hands. Eventually, someone or something is going to get hurt with a sloppy DFD. A sloppy DFD is akin to reading the newspaper or using your smart phone, all slumped down in a super cozy chair. Sure, you can do it and it can even feel really good for a time, but if you do it forever, your body will eventually take issue with it. No posture is a bad posture, but any posture held for perpetually or repetitively will eventually create soft tissue and joint imbalance. In the case of downward facing dog, it is too easy to flop into the pose, or what I call “vomit on the mat.”This means you can just press into a shape that resembles an upside down “U” and hang out there for as long as your wrists, back, and legs can take it. There are far better postures – ones that I use as preparatory or prerequisite postures for DFD – that I will discuss below. DFD isn’t a sustainable pose without proper musculoskeletal awareness and recruitment. requires both muscular strength and endurance, as well as excellent range of motion (osteokinematics) and joint play (arthrokinematics). Muscular strength and endurance equals power, and that takes time to build. Yet many yoga teachers toss out DFD in a yoga class as if it isn’t that big of a deal. But it is a big deal.If you aren’t using the right muscles and muscle groups, and if you aren’t using the optimal joint alignment, DFD’s utility drops drastically while its injury risk can increase substantially. There are more difficult poses to perform that should act as prerequisites for the real DFD. DFD is far more difficult than the sloppy “U” or reversed curve versions of DFD most folks are taught.The sloppy “U” DFD version is rather self-explanatory, but the reversed curve one, the one that I most often have “un”teach clinicians and students, is the more dangerous one. It’s most often used with veteran yogis who can easily press past normal physiological range of motion, reversing the normal curvatures of the spine (cervical lordosis, thoracic kyphosis, and lumbar lordosis). It is more dangerous because those who practice this way were wrongly taught it is a more advanced DFD (think Light on Yoga DFD demonstrated by B.K.S. Iyengar), and by the time I see them, they have little ability to control gross or fine ranges of motion in the spine, and more often than not pain in the neck, upper back, and headaches, which can lead to neurological or vascular complications. Left unattended, these problems spread to the pelvis and hip, and can progress to pelvic pain and/or sexual dysfunction due to altered length/tension relationships in the pelvic floor and respiratory and laryngeal/thoracic diaphragms. Differential diagnosis of these issues, in my clinical practice, often starts with looking at the prerequisites I am going to discuss below, since a cursory look at DFD easily reveals lack of motor control and awareness of range of motion best fit practicesin DFD. When I teach DFD to healthcare providers, I spend hours breaking down the posture and prerequisite postures with them in a lab format. I take them through each joint involved, what is happening, and what the ramifications are for positioning a joint in a certain way. I’ll discuss a short sequence version of it below. For the more than 86% of folks who will have back pain, DFD should be contraindicated (aka ditch the DFD in the name of safety) until certain parameters are met.In the acute phase, someone with LBP should see a physical therapist. In the subacute and chronic phases of LBP, a physical therapist remains very helpful, and with proper alignment and meeting the prerequisites (see below), most people can safely progress to DFD. Many of those with pain will go on to have disc bulges, shearing between the vertebral segments, or osteoarthritis around any part of the spine. None of these conditions are a deal breaker, and none of them necessarily create pain. However, having one of these conditions means it becomes even more necessary to cultivate good proprioception. So for teachers this means teaching a biomechanically and neuromuscular “Best Fit DFD.”It is a version of DFD that is most difficult, and yet at the same time provides a means for reliably performing DFD for the rest of their lives without creating or exacerbating injury. Performing DFD requires optimal arousal and recruitment of each of the locks (defined below).It is why as a 20-something you can do any old downward dog you fancy. When you are in your 30’s, let’s say as a woman, you start to have trouble during a pregnancy or with weight struggle or pelvic or menstrual issues. By the time you are in your 40’s, you may have had back or neck pain, and the shoulder that would hold you up in your 20’s and 30’s just isn’t quite what it used to be. Why is that? Because the DFD of your youth likely wasn’t sustainable. Let’s make this personal: The DFD I did when I was 21 is not the DFD I practice now. Then, I would reverse my spinal curves, shear my cervical spine forward when told to touch my forehead to the ground, which by the way also hyperflexed my shoulder to the more than God-given 180 degrees of which it is capable. I put my hands shoulder width because I was told to, which by the time I was 31 no longer worked due to pregnancy-induced shoulder pain and a nursing injury that led to a rotator cuff tear. I also completely ignored scapulohumeral rhythm requirements because I could. I didn’t have to worry about that with a brand spanking new 20-something year old shoulder. And with a pelvic floor untraumatized or stressed by pregnancy and childbirth, I also had the privilege of ignoring the optimal length/tension relationship and motor function of my pelvic region. This is a big list, and to get through how I teach DFD requires several days of teaching, whether I am teaching patients, students, therapists, doctors, or other healthcare providers. I have spent the last 18 years training the yoga trainers, and the remainder of that time I spend in patient care. Of all that time, DFD is the pose, along with inversions, that I believe has the highest risk for overuse injuries, especially in the hands, shoulders, pelvis, and spine. AD Breath. By permission from Handspring Publishing Ltd. ©Garner 2016. All rights reserved. AD Breath – The abdominodiaphragmatic breath is a passive decent of the respiratory diaphragm stemming from active, at-rest inhalation. It is critical for autonomic regulation and systemic function, including stress control. AD Breath is the gold standard for physiological employment of the respiratory diaphragm. This breath type should include passive descent of all three diaphragms, thoracic/laryngeal, respiratory, and pelvic. Limit degrees of freedom by reducing available movement variables available in a yoga posture basedon available controlled flexibility. That means, only provide as much movement in a pose as a person can safely control. Not use valsalva (bearing down with a breath hold) at any time. Use a graded range (1-100%) of MVIC (maximum voluntary isometric contraction and sometimes isotonic) to facilitate safety in functional task (yoga posture or ADL) completion. Choose a voluntary isometric and/or isotonic contraction that is the minimum needed to elicit controlled flexibility (stability through form closure, force closure, and safe load transfer) through a joint. Use of these guidelines for teaching Locks can modernize the use of historic yogic locks for today’s population. Those with cardiovascular disease, pregnancy, glaucoma, metabolic syndrome, or any type of chronic or persistent pain have contraindications for breath holding or unchecked movement (movement without stability). And yes, locks have an energetic component which is not ignored, however, their use has scant evidence-base and this post is just sticking to the facts of biomechanics and soft tissue safety. Locks I teach are refined and evolved per the evidence-base and are “mild” forms of their traditional or full counterparts. The Locks System. By permission from Handspring Publishing Ltd. ©Garner 2016. All rights reserved. Abdominal Lock (Uddiyanda Bandha)** – The partial Abdominal Lock is not synonymous with TATD Breath because it does not employ the force couple of pelvic floor (PF) or root lock recruitment. However, it does employ less than a 100% MVIC (maximum voluntary isometric contraction) and does not use a valsalva. The mild Abdominal Lock should be perfected in a small spinal neutral zone before attempting to teach the lock outside of spinal neutral in order to avoid compensatory patterns such as gluteal gripping, paraspinal tonic contraction, breath holding, or use of the external oblique (EO) or rectus abdominis in place of the TA. Presence of excessive recruitment of the EO during attempted TATD breath is considered a nonoptimal strategy and can negatively affect load transfer to the pelvic and increase PF descent/pressure. Root Lock Posterior (Ashwini Mudra)- 3. & 4. work together – Use of the PF includes the three lower diaphragms of the PF and the Anterior/Posterior Root Lock. Superficial muscles are the superficial transverse perineal muscle, the bulbocavernosus, and the ischiocavernosus. The muscles of the urogenital diaphragm are the sphincter urethrae membranacaea, and the deep transverse perineal muscles.The pubboccygeus, puborectalis, and iliococcygeus form the deepest layer. Hip Lock– The Hip Lock provides dynamic lower quarter stability and is chiefly influence by the hip “RTC” and gluteals.Just as a house must have a sturdy foundation, building a yoga posture requires the same approach. Foot, ankle, and knee alignment can intimately affect the health of and ability to proximally stabilize joints and vice-versa. Co-activation and synergistic contraction that contribute to musculoskeletal balance and health in the lower quarter are heavily influenced by proximal stability, especially in the lumbopelvic region. This means that the Hip Lock contributes, by synergy and in conjunction with TATD Breath, to lumbopelvic integrity. Great Seal Lock (Maha mudra) – The Great Seal Lock employs all six previous locks into one final, seventh lock, performed in a seated, Head to Knee pose (janu sirsasana) gravity-dependent position. Feeling the contact of the perineum on the floor or blanketed surface or chair can provide biofeedback while facilitating adductor length, pelvic outlet opening, myofascial mobilization via deep respiration, hamstring length, neural mobilization for the sciatic nerve, pelvic awareness, postural and trunk control and awareness, and neural patterning via proprioceptive neuromuscular facilitation (PNF) hold/relax pattern. However, note that any yoga posture can employ the six locks to create stability and self-preservation, creating safety and sustainability in any pose, particularly in DFD pose. *I know these terms may not be familiar to everyone, but I’m happy to explain them if you have questions. My bookalso elaborates on the terms and how to put them to use in a yoga-based Functional Movement Assessment (FMA). **These three locks make up the TATD Breath. TATD Breath requires conscious involvement of three diaphragms – thoracic, respiratory, and pelvic – in order to facilitate adequate intra-abdominal pressure through contraction of the TA, the PF (Anterior/Posterior Root Locks), and conscious relaxation of the thoracic diaphragm (which could be associated with a Chin Lock). Abdominal Lock, which is specifically defined as engaging the TA. The TA is thought to be a primary stabilizer of the lumbar spine and mechanism for healthy load transfer between the trunk and lower extremity. TATD Breath. By permission from Handspring Publishing Ltd. ©Garner 2016. All rights reserved. Posterior Root Lock (posterior PF). Arm Spiral– Use of the force couple of periscapular stabilizers, including SA and the upper and LT’s bilaterally, in order to prevent scapular protraction, winging, or tipping. The UT should not be the primary stabilizer, and should be pliable and not tonically contracted during four-point and DDP position. Four Point – A position of hands and knees, often called “Table” where the arms observe and maintain Arm Spiral and the knees are under the hips and hip width distance apart. The spine is in neutral, observing all Locks. DDP– Downward Facing Dog Preparation (DDP) Posture and “Glide” – DDP includes the postures Four-Point position, Cat/Cow (optional), as well as the DDP. DDP is a pre-posture designed to identify movement impairments and neuromechanical precursors for injury, such as scapular stabilizer insufficiency or scapular dyskinesis, non-optimal movement strategies such as trunk flexion and extreme lumbar extension or primary recruitment of the UT to stabilize the shoulder complex during the knee lift portion of DDP. Hands and knees or Four-Point position is required prior to performance of DDP. Considering all of these degrees of freedom, the variables that constitute any movement, available in DFD, it makes sense to begin with DDP as your goal and move toward DFD once all these prerequisites have been safely met. As you can see, most of my patients and students no longer even need DFD as a goal in their practice, when DDP is available as a prerequisite and substitute, that when done correctly, holds far more therapeutic and fitness value, especially for populations with a history of back pain. 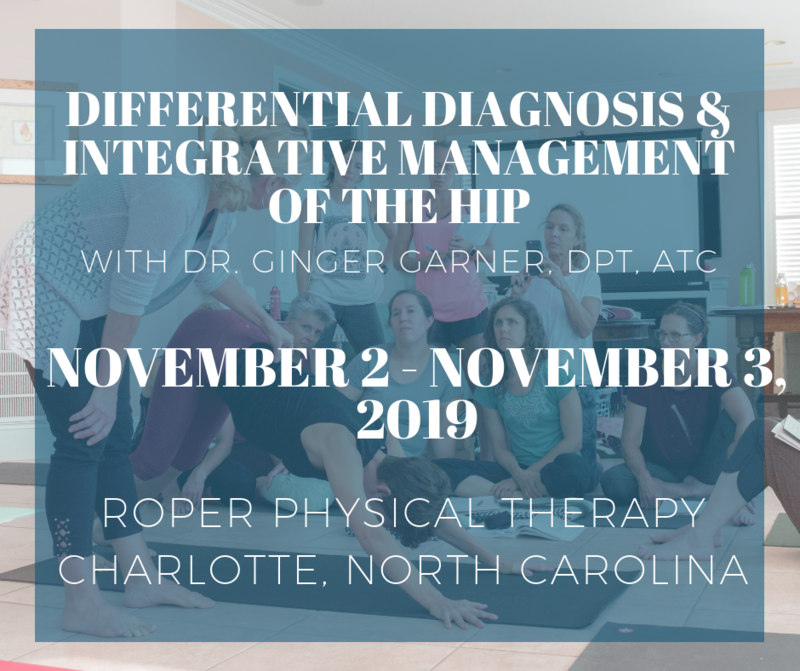 Dr. Ginger Garner is a longtime practitioner of yoga, orthopaedic physical therapist specializing in pelvic and chronic pain, founder of Professional Yoga Therapy Institute®, and author of Medical Therapeutic Yoga, now in its 4th foreign language translation. Garner, G. 2016. Medical Therapeutic Yoga: Biopsychosocial Rehabilitation and Wellness Care. Handspring Publishing Ltd., Edinburgh, UK. Thank you for the detailed article and video. I am curious though about practitioners (like myself) who have very strong carrying angles in their arms – wouldn’t the arm spiral you show for stabilization actually put more emphasis on the carrying angle and end up hurting? What do you recommend for the position of the arms for those with a strong carrying angle? The best option that I have found at this point is to take my hands out the width of the mat (as you show), angle my wrists out laterally a bit and isometrically engage the strength of my arms by pushing them out without moving. I still find that I have a bit of tension in my anterior delt from chaturanga and am wondering if there is more that I can do to realign better? You bring up a great question. Lots of women have large carrying angles. The angle of the elbow cannot be changed – so the biggest concern is not the “Arm Spiral”, which creates proximal stability and would improve safety and longevity in the pose – and many others as well, especially closed kinetic chain activities in the upper quarter. The biggest concern is hypermobility – aka hyperextension – at the elbow. The carrying angle is not synonymous with elbow joint hypermobility or hyperextension – so the good news is – women (myself included!) with large carrying angles have nothing to worry about there. However some women with large carrying angles will have hypermobility and subsequent hyperextension – and that is the real problem. We have to make sure that in doing “Arm Spiral” they are maintaining a neutral elbow joint and not flopping into hyperextension. Sometimes I will use biofeedback to help prevent that – or physical blocks (like athletic taping. I am also a licensed athletic trainer so taping is in my wheelhouse). So far as aligning your own pose based on your carrying angle…I would need to see the pose to comment. I agree with mat width hands – that is a smart thing to do for anyone struggling with upper quarter issues in postures like DFD. Isometric work can also help – but the key is making sure the right muscles are firing (neuromuscular patterning) and things like the lats aren’t just substituting. Think of the lats like the hip flexor – sure, it can act as a stabilizer, but it isn’t a very good one, and when overused, can create problems. Make sense?